Beverly Hills: Sunday, April 10, 2016, 6:30 p.m.
Redondo Beach: Monday April 11, 2016, 8:00 p.m. Thousand Oaks: Tuesday April 12, 2016, 8:00 p.m.
Pasadena: Wednesday, April 13, 2016, 8:00 p.m. He has worked for both Democratic and Republican presidents and held some of the most prominent and important positions in the land while. As Secretary of Defense and Director of the Central Intelligence Agency under President Barak Obama, White House Chief of Staff and Director of the Office of Management and Budget under President Bill Clinton, Assistant Secretary of Health, Education and Welfare under President Richard Nixon, and democratic member of the House of Representatives for 16 years, Leon Panetta clearly devoted his four-decade career to the American people. He will share with us his candid insights on U.S. intelligence, defense and cyber security strategies, world affairs, and the global economic and political challenges of the 21st century. A Monterey native and Santa Clara University School of Law graduate, Mr. Panetta began his long and distinguished public service career in 1964 as a First Lieutenant in the U.S. Army, and upon discharge went to work in Washington as a legislative assistant to U.S. Senate Minority Whip Tom Kuchel of California. In 1969, he was appointed director of the U.S. Office for Civil Rights, where he was responsible for enforcing equal education laws, and later he served as executive assistant to the mayor of New York City. He then returned to Monterey, where he practiced law until his election to the U.S. House of Representatives in 1976. 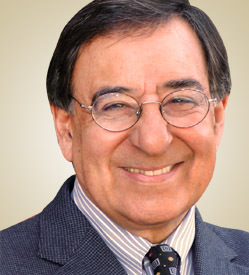 Serving his Central Coast district in Congress for 16 years, Mr. Panetta was a key participant in agriculture, healthcare, marine and federal budget issues, and from 1989 to 1993, he chaired the House Budget Committee. He authored a wide range of legislation, including the Hunger Prevention Act of 1988, Medicare and Medicaid coverage for hospice care for the terminally ill, and numerous measures to protect the California coast, including creation of the Monterey Bay National Marine Sanctuary. In 1993, Mr. Panetta left Congress to serve as director of the Office of Management and Budget for the incoming Clinton administration. There, he was instrumental in developing the policies that led to a balanced federal budget and eventual budget surpluses. In 1994, he accepted appointment as the President’s chief of staff, and immediately brought order and focus to White House operations and policy making. Upon leaving the Clinton administration in 1997, Mr. Panetta joined with his wife Sylvia to establish and co-direct the Panetta Institute for Public Policy, based at California State University, Monterey Bay. Reflecting Mr. Panetta’s own ideals and personal example, the nonpartisan, not-for-profit study center seeks to attract thoughtful men and women to lives of public service and prepare them for the policy challenges of the future. In addition, Mr. Panetta developed programs for the Institute, such as its Leon Panetta Lecture Series, Congressional Internship Program and Leadership Seminar, that help to inform Americans about the critical issues facing our communities, states and nation in the 21st Century. Institute programs also aim to inspire a deeper engagement in the democratic process while simultaneously setting a public example of service and commitment. Returning to public service in the Obama Administration as director of the CIA, he ran the operation that brought Osama bin Laden to justice, and, as Secretary of Defense, led the effort to develop a new defense strategy, helping bring two wars to an end, and opened up opportunities for everyone to serve in the military. Mr. Panetta chronicles his life in public service in his memoir Worthy Fights, which was published by Penguin Press in the fall of 2014. Over the years Mr. Panetta has served on numerous boards and commissions. He co-chaired California Forward, the Joint Ocean Commission Initiative and Governor Schwarzenegger’s Council on Base Support and Retention. In 2006, he served on the Iraq Study Group, a bipartisan national commission seeking a new course for the war in Iraq. Mr. Panetta is the recipient of many awards and honors. His most recent awards include: the California Teachers Association’s “Friends of Education Award”; the Judicial Council of California’s “Stanley Mosk Defender of Justice Award”; “The Harry S. Truman Good Neighbor Award”; the Sons of Italy Foundation’s “National Education & Leadership Award”; the “Peter Benchley Ocean Award for Excellence in Policy”; and the Intelligence and National Security Alliance’s “William Oliver Baker Award”.